I won't lose the Winter. If you aren't familiar with Northwestern Winters, then you really haven't experienced incessant rain. I've lived in other parts of the country and when they see steady rain, it lasts for a couple/few days and everyone starts getting antcy. Here in the Great Pacific NorthWest, 2 or 3 days of steady rain could happen during the Summer drought. Steady rain here is up to 30 straight days of measurable precipitation. So, getting the bus where it won't sit where the water collects is a big deal. Next to the garage will be well drained, on the lee side of the prevailing rain direction, under a tent thing, closer to the tools, light and power in the garage, and last: a portable heater will actually warm the work-space. I got a lot done on Sunday, and Hal nearly finished out the rear mount. Starting with his work, he was able to get the rear mount adjusted into place, and the final set of bolt holes set. The rear support bar was then removed for paint. We decided that the tower (hollow box) could be further supported / cross-membered by welding a plate onto the rear (FIF) of the tower. As I consider how that will look, I'll have to think up something interesting to paint there. Maybe a smiling sun or something non-commercially iconic. Hal also got the fuel filter bracket mounted to the right side of the engine compartment using a little bracket extension he fab'ed. We talked about integrating the fuel return line, but we didn't hit on a solution. On my side, I did the little things under the bus to get it ready to move. This included getting the shift linkage and CV joints (axles) re-connected to transaxle. Though that sounds very little, it took me a couple of hours because the shifter and transaxle hadn't seen each other in, like, 2 years. I got a bunch of other things done before Hal arrived, like rem oving the masking on the turbo and reinstalling it with new gaskets. I got the vacuum ball installed (with original bracket), plumbed into vacuum system and the vacuum pump plumbed in. I still have to integrate the power brake booster, but that should be relatively straightforward. 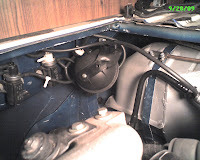 There's a picture here showing how it tucks nicely under the westy cabinet on the left side of the engine compartment. Last, I got the water flange in. This took a little more modification, unfortunately. I had to cut off the bib on the bottom of the flange as it hits the floor of the fuel tank bay. I tried cutting just part of it off, but there really wasn't space for a hose to connect once I got it down to where the flange would fit. There was maybe 1/4", and that included that thick ring right where the flange and the bib meet. I figure I can run a short section of rubber hose to a metal line that has a bib threaded into it. I can only think of one drawback to this: the original location was at the intersection of the cabin heat circuit return and the radiator return. This would expose the oil:heat thing to the cooling benefits of both systems. My bib solution would only expose the oil:heat thing to the cooling benefits of the radiator. I'm not sure if this matters, but its worth noting. connecting clutch cable, shooting the paint on the support bar, installing the starter. After that, there's primary electrical, the cooling system, etc. 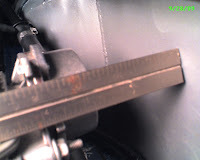 top - distance from fuel tank to vacuum pump. Its just over 2-1/2". botom - vacuum system. air cleaner, waste-gate still need to be tied in.